This is the best iPad Folio Style Case with Integrated Bluetooth keyboard available today. It's also currently unique. There is, however no reason why another manufacturer couldn't release a cheaper alternative with a much better keyboard tomorrow. By next year there might be half a dozen of these things on the market. I'm not normally the kind of person who is happy waiting patiently for the next iteration of product. However if you have more willpower than myself, I suggest you might want to wait it out for another couple of months so that you at least have something to compare this against. I believe that a more suitable price for these keyboard cases would be £40-£50 and I think we'll see the current prices moving downwards pretty quickly. I'm also confident that another manufacturer can put together a better keyboard than the one built into this case. If however you can't wait, then this keyboard works fine and it's more comfortable and quicker than banging away on the screen for long periods of time. In fact last week I typed a thousand-word report on it, something I'd never consider attempting on the iPad on screen keyboard. 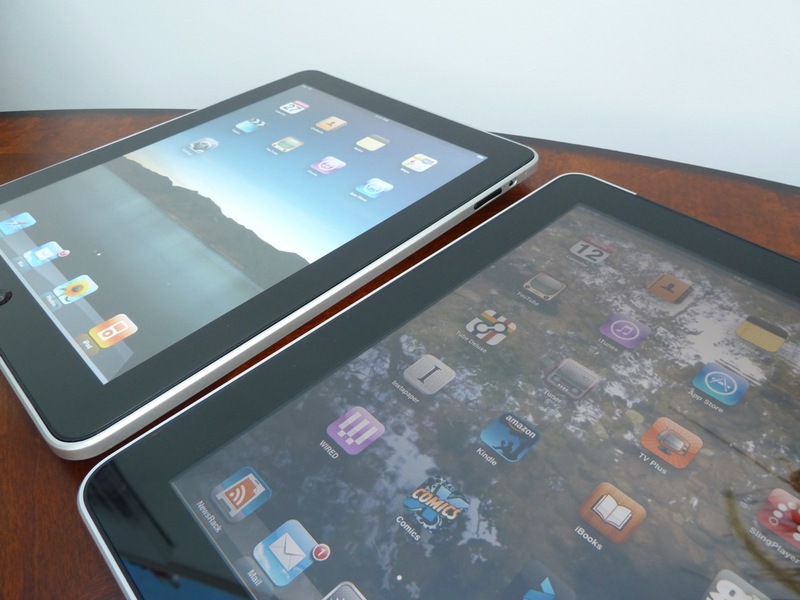 As a footnote I'm always amazed at the anti iPad vitriol on the net. When I don't want to buy a product I don't try and rubbish it, I just ignore it. The reader-posted comments about this keyboard on the various gadget sites seem so angry and judgemental. The most common comment was based around the idea that if you want to buy this case then you should have bought an Netbook instead. I don't want a netbook. I want a 10" iOS device together with an occasional keyboard for those times I need to travel for work and write up reports in my hotel room. This case, or something like it, is exactly what I need. It was purchased from Gearzap here in the UK - Product link here. Gearzap also have some other interesting accessories for the iPad (including other more traditional bluetooth and folding keyboards) - check them out, they are friendly people to deal with. I paid the full retail price for my keyboard - £60. The Hamburger Speaker (it's garbage). A month or so ago I made the mistake of buying a cheap knock-off version of the X-Mini Capsule speaker which went by the name of the Hamburger speaker. The Hamburger's 'improvement' over the original official X-Mini speaker was that it incorporated a built-in MP3 player….it's a one-stop party in your pocket! I unpacked it in front of the video camera with the intention of putting together a video review. Unfortunately It soon became apparent that the Hamburger speaker was complete and utter rubbish. I forgot about putting the review together and the video footage was stored away into a folder. Just today I ordered the official XMI X-Mini II speaker for £14 from Play.com (it's in their sale) and this reminded me about my poor experience with the Hamburger speaker. I worried that without an impartial review to watch, someone else might make the mistake of wasting their money on the Hamburger rather than buying the X-mini II. So in the interest of trying to help people avoid wasting their money too - I've resurrected the Hamburger video, edited it together and and present it here for you as a cautionary tale. Not all cheap things are bargains, sometimes they are just cheap. A review of the Car DVR D011 dash camera. Over the last couple of weeks I've been testing out a mini video camera designed for the purpose of recording footage from a car. It has performed well - but I think I've reviewed enough of these mini cameras for a while. Most of the models I've tested recently have utilised the same image sensor technology - albeit with slight functional variations. I now think that I will hold off doing any more mini video camera reviews until something different turns up. If a native 720p sensor becomes as cheap as the ubiquitous 720x480 device used in most of the current crop of mini cameras I will no doubt look again at these devices. If you are interested in seeing how the Car DVR D011 performs - click the video below for a full review. One of the biggest problems with iOS devices iPhone & iPad is the quality of Youtube clips when viewed over a 3G connection. This isn't a bandwidth issue - it's just some weird arbitrary restriction. Well it turns out that it doesn't have to be this way. I tried the new beta iframe embedding option on some of my old videos during my migration to squarespace and they now play at full quality over 3G. It's clear that this is the way all things will go in time (Youtube advise that they will be switching across to this embedding method when they have ironed out any kinks) - but if you want a taste of the future - try visiting this site on your iPhone or iPad over a celluar connection and click on any of the videos on this page - the difference is clear. For some reason this has stopped working and I can no longer view any of my videos over 3G on my iPad. So to fix the problem of all my embedded videos just showing up as a black box, I've reposted the more recent videos using the normal Youtube embedding option. HD over 3G was good while it lasted - it just didn't last very long. I'm in the process of moving my blog from Wordpress to Squarespace for greater flexibility. This site is therefore currently just a work in progress while I play with the countless options available to me. It certainly needs a lot of jazzing up. Another test of a mini camera. This one gets a number of important things right, but ultimately it is the picture quality (bleached out and grainy) that let it down. However, considering that it only cost me approximately £16 delivered from an Ebay seller in China ....shenzhenruixing. (link correct at time of posting) some might find it easy to forgive these shortcomings. I'll keep on hunting for the perfect mini camera - another new model was delivered today, review to follow when time allows. Hanging my favourite movie on the wall (in style). I've put together another video review of a mini "spy" camera. There seems to be a real interest in these videos - so I've started to buy new cameras on a regular basis just for review purposes. I try to break even by spending any money I make from adsense clicks (the adverts that pop up over my youtube videos) on new items to review. I don't think I'll ever get rich from this scheme - but it enables me to buy a few more gadgets than I normally would (even if I don't really need them). I've already got another mini video camera on its way from HK - so in a few weeks I should be able to post another review. I've occupied my spare time over the last few weeks putting this thing together. 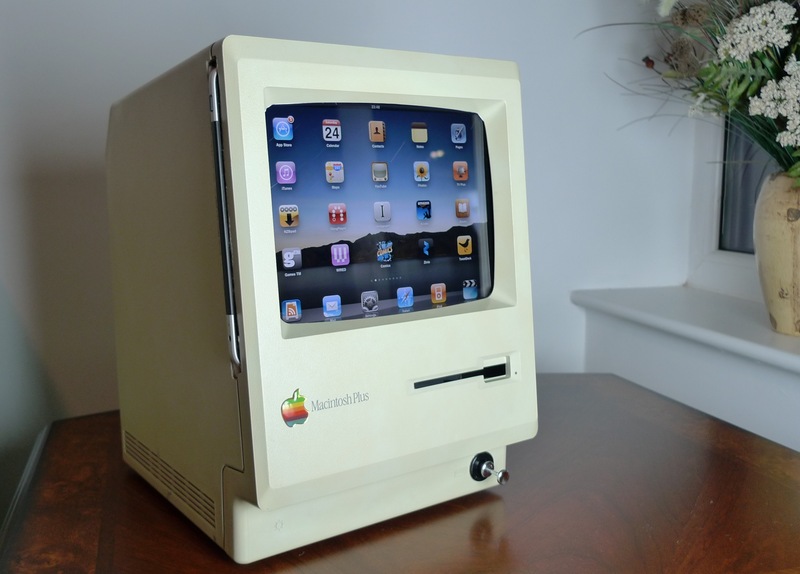 It's an old Macintosh repurposed as an iPad dock. I'm pretty happy with the finished article, and my rotary tool skills are significantly more advanced now, than when I started. I'm by no means a hobbyist, so this is the most complicated thing I've constructed. If I was a better craftsman, it would no doubt have looked a lot neater. One thing I might change If I were to do it all over again, would be to simplify it by using a sync cable rather than a dock. I made the first 'advertisement' section of the video in a tongue-in-cheek manner (I don't really suggest keeping it in the kitchen or by the bed), its just a bit of fun. I received a dummy iPad in the post from HK today. Its a perfect 1:1 non working copy. The only real differences (other than the complete lack of action) are the fact that the body and the screen are plastic rather than aluminium and glass - which make it just a tad lighter than the real one. Even the buttons (the volume and home) click the same as an original. You may be wondering why I've bought a dummy iPad when I have already have a real one.....well it makes more sense than you might first think. I'm in the process of constructing an iPad holder/docking station device (all will be revealed when I'm finished) and I needed a template to drill/carve/cut around. I didn't want to risk the chance of damaging my £699 64GB 3G original so I picked up this replica from Ebay. If I scratch the screen of this one with a screwdriver, it won't be such a big deal. Ever since iPhoto added location based functionality I've wanted a camera that could take advantage of it. I'm not an SLR user - being very much just a holiday snapshots type of chap. That being said, I still want my snapshots to be as sharp as possible. It seemed to take an age for the manufactures of compact cameras to integrate GPS into their devices - the first model that I knew about was the rather poor Nikon P6000. Another couple of models slowly limped to market - all of them getting equally poor reviews (the GPS didn't really work and killed the battery in the process). So I gave up waiting and got my (non-GPS) Panasonic LX3 - the best compact available within my budget (and at the time, the best within any budget). I still longed after a GPS equipped camera though (as always if you can't get something it makes it even more desirable). I've tried a keychain GPS geotagging dongle in the past and it just wasn't up for the job. Either I could set it to save its co-ordinates on a short interval ( so it's battery would only last a couple of hours) or lengthen the interval and make the data inaccurate and useless. The software was useless too and didn't work on my Mac. 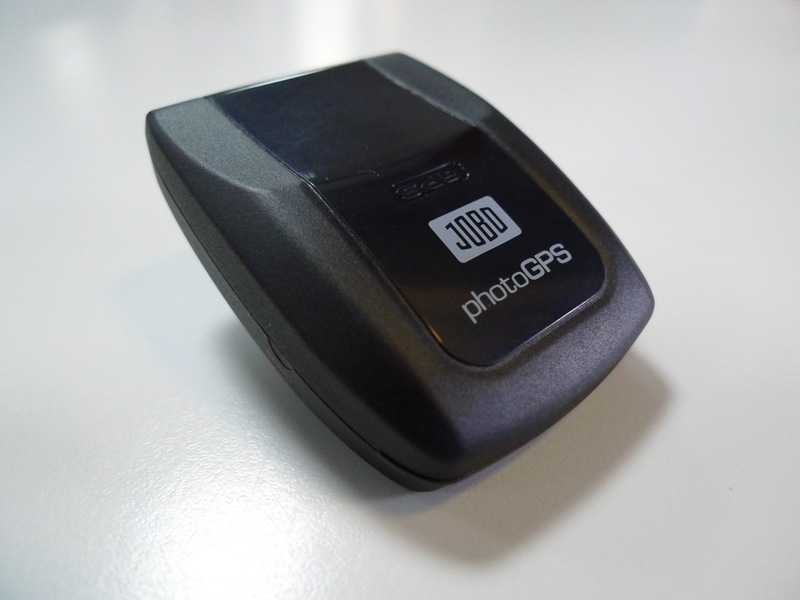 I had my eye on the Jobo Photo GPS hotshoe device before - but it's SLR scale bulk and price put me off. So I was very pleased to see Jobo re-launching their hot-shoe GPS logger as a new smaller and cheaper device. The new model for 201o is called the PhotoGPS2 and it looks like it will be just the ticket. I pre-ordered one from Germany and I now present you with the first video review of the 2010 Jobo PhotoGPS2.